Escaping from her abusive ex-husband, Marissa Simpson came back to her hometown to start over. She had no intention of getting involved with another man, or with the community she left behind all those years ago. That is, until Riley McCade showed up. Riley was the Sheriff of Granite County and he commanded a work force of fifteen deputies. He loved his community and went out of his way to protect and serve. When he met up with Marissa, he was bound and determined to get to know her even though she said she wasn’t interested. The more he got to know her, the more he learned of her past. Could he protect her and earn her love? 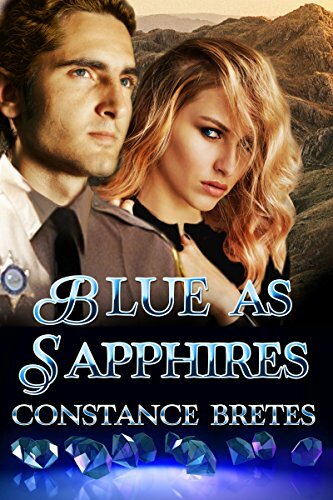 Stop by here: http://www.constancebretes.com/news–things.html for a chance to win a free copy of Blue As Sapphires. Connie spends most of her time behind her computer, writing, editing and researching for her next story. When she’s not there, she can be found checking out ghost towns, sapphire mining, and gold panning with her best friend and husband, Jim. Her other hobbies consists of basket weaving, and jewelry making. I think your book cover striking, but I really love that font! Best of luck. Thanks, Judy. Appreciate your visit. We used to take our son out west when he was little and pan for gold! Such fun. Best to you on your release, Connie! Thank you, Darcy, for visiting! Fabulous cover, Connie. Domestic abuse is one of those topics that stay hidden and needs to be out in the open. People need to know they have recourses. Your book should give people hope. Best wishes. Thank you, Diane, I appreciate your visiting and kind comments.